Are You Mything Out on Employee Engagement? Employee engagement has been capturing the attention of organizations because of the potential benefits ranging from better financial results to employee well-being. Here are 5 myths or mistakes that many organizations make with their employee engagement work. Engagement measures must be anonymous. Engagement requires a name and a face not an anonymous survey. I engage when I know others see me and they are thinking about me. Disengagement should not be a punishable offence; rather it should be the trigger for a conversation. I believe we rely far too much on anonymous surveys for engagement data which means that we have organizations where it is not safe to talk about how all employees are experiencing their work. If that is the case, we don’t have an engagement issue; we have a safety and conversational challenge. Engagement is about them. Far too often I see employees referred to by managers as “them” and employees refer to leaders as them. We must realize that “them is us.” CEO’s and presidents are employees who may struggle with their own engagement and we will be sowing the seeds of connection or engagement challenges when we believe we are apart from the organization not a part of the organization. Engagement is the organization’s method to just get more work out of people. Employees need to both know and experience the benefits of engagement. Engagement can increase well-being, create a positive model for our children, enrich the hours of our working days, help us make a difference, create a richer experience for our customers, energize our working day, etc. Engagement is not a problem to be solved it is an experience to be lived. There is a way to engagement. Engagement is not something extra it is how we work and connect in this decade. Engagement is so much more than a happy dance pasted on YouTube or a half-day recognition and engagement program. Leaders and managers must stop seeing engagement as another item on an endless to-do list and start to integrate engagement ways to build relationships and achieve results through invitation, conversation, connection, co-creation, and community. There is no way to engagement, engagement is the way. Don’t myth out on the potential benefits of an engaging organization that fosters high levels of employee engagement through visibility, unity, experience, integration, and invitation. David Zinger, M.Ed., helps organizations and individuals increase employee engagement. He is a writer, educator, speaker, and consultant. 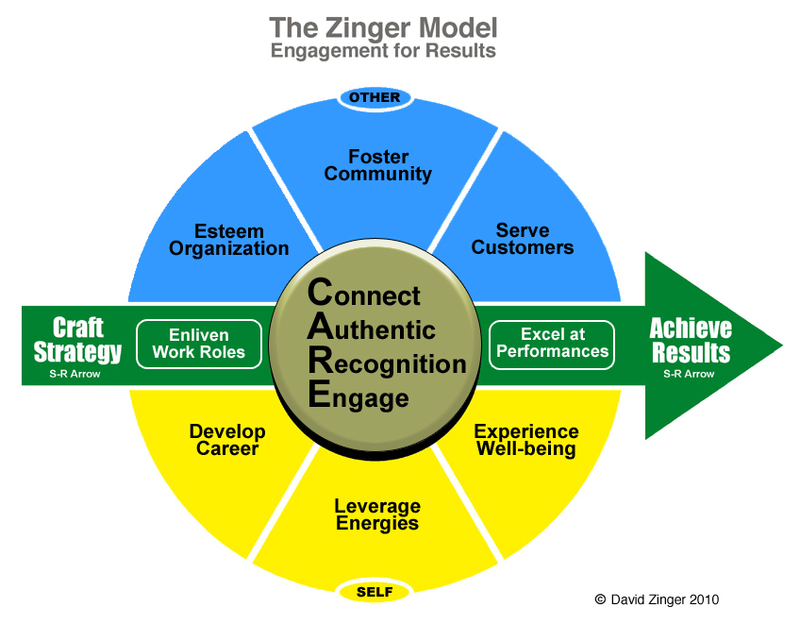 David founded the 3100 member Employee Engagement Network and he also wrote Zengage: How to Get More Into Your Work to Get More Out of Your Work. He is committed to increasing employee engagement 20% by 2020. Contact David today to improve engagement where you work (Email: dzinger@shaw.ca / Phone 204 254 2130 / Website: www.davidzinger.com). Great post David! There sure are a lot of myths floating around out there when it comes to Employee Engagement and I appreciate you taking the time to clear them up! I have shared your post with my readers in my Rainmaker ‘Fab Five’ blog picks of the week (http://www.maximizepossibility.com/employee_retention/2010/11/the-rainmaker-fab-five-blog-picks-of-the-week.html) to serve up some truth on these important engagement topics. Thanks for the comment. Hopefully we don’t “myth” out too much. Well said and an urgently needed reminder. I cannot help using EE in arguing against the flawed mindset of leaders who keep harping the senseless debate on “HR must earn their seat at the executive table”. These leaders just don’t understand what EE is beneath all those people connected program initiatives. First, they “engage” the wrong guy for the HR job. Then, they introduce the anti-thesis to EE and teamwork by saying, s(he) has to “demonstrate the right to be at the table”. Some have even resigned to, citing many survey feedback from CEOs, to support “HR just don’t get it!”. The funny thing is, it seems like only HR don’t seem “to get it”, demanding that HR be more ‘strategic” to the business. Some charge HR incompetence to failing to understand the business language and overzealous in protecting the company from labour lawsuits. I am not exactly sure where these so called business and executive “leaders” come from, but picking this line of adversarial and separatist attitude towards a “support” role and function certainly deserves condemnation. I would like to elevate EE to a higher platform of organisational value and contribution. One that would significantly help address the biggest leadership challenge – failure of strategy execution. Walk around the workplace and ask people if they know what the business goals and KPIs are?. I bet 90% will not be able to or come close relating what they do on their job. Too often, managers are fixing problems on the run, in the name of business agility, global speed and market explosion. Sometimes, I begin to wonder what exactly is it that they want from HR or want us to do?. Join the sales team and bring in orders or join the assembly line to increase the capasity. When will business “get it” that the role of HR is to add value to the font liners, including the executive levels, in developing the strategic capability of people in sustaining the business for stakeholders interest. How can this be done if there no inclusiveness, transparency, teamwork, inter-dependence, collaboration, respect for role, buy-in to change, commitment to values, faith in people, including HR. It’s sad and pathetic to see leadership at senior executive levels taking on such a stance, knowing (yet, denying) all it sows is marginalisation, discord, disengagement, antagonism and dysfunctionality and toxicity. Sometimes, business leaders think they need complex and sophisticated technology and systems to achieve better results. Yet more often than not, all it requires is a basic application of common sense and simple solutions.